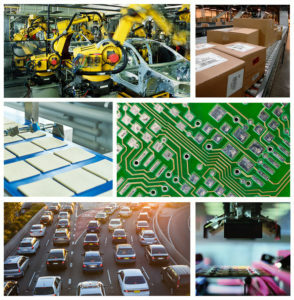 Machine vision interfaces have continued to evolve over the years increasing data throughput and cable lengths. Commonly used interfaces are GigE and USB3. However, 5GigE is an interface now gaining attention in the industrial imaging / machine vision market with some nice advantages. 110 MB/s of sustainable throughput. In real world terms, a HD, 2MP camera can get 50-55 fps in 8 bit mono or 8 bit color mode. Note, this isn’t real HD, since you need 60 FPS. Data cable lengths up to 100m using regular CAT 5e/6 cable. Easy to put multiple cameras on a system. 420 MB/s of data throughput. A HD 2MP camera can run 60 fps in 8 bit mono or color and can also run RGB at 60 FPS no problem. With the higher throughput, a 5MP camera can achieve 85 fps in 8 bit mode. Data cables up to 5 meters and up to 20 meters with active cables. However, active cables can be quite costly, adding up to $200 in cost. Not as easy as GigE to put multiple cameras on a system, and gets harder with each additional camera, especially if you have limited USB3 controllers. As a note, there is no cost difference when using cameras with the same sensor from the same manufacturer with USB or GigE! They will cost about the same with no premium for one interface over the other. What are the limitations of GigE and USB3 now solved by 5GigE? USB3 is limited in cable length, so going faster than GigE is great, but you can not have long cable lengths. GigE has cable lengths up to 100 meters, but is limited to ~ 110MB/s of data, so you do not have the high frame rates as in a USB3 camera. USB3 in 4+ camera systems is not as stable as GigE AND you’re still limited on cable lengths. Wait! – What about 10GigE? Up until now, 10G was the next interface. However, the jump to 10G has quite a few limitations as outlined below. Heat generation is significant, so cameras are large and not in the smaller 29 x 29mm cube form factor. Minimal number of manufacturers for 10G, higher cost. Special cabling, either optical or high quality cat 7. Require greater than 110MB/s of data and need long cable lengths. Where there is the required combination of 110MB/s for high frame rates, multiple cameras and long cable lengths, 10G is a perfect solution. We have seen that the need for higher bandwidth + long cable lengths is more prominent vs. the real need for 10GigE! Introducing 5GigE that provides increased bandwidth, long cable lengths at reasonable prices! or N Base T.
5GigE (also known as N Base T) has become a new standard for industrial, machine vision cameras. In the general compute world, a much much larger market than vision, there has also been a need to go faster than GigE. However, the issue of replacing the existing cabling is the major issue preventing this. If you think of a big box store, say a Home Depot for instance, the amount of cabling is huge. Ripping that out and rewiring far exceeds the cost of the equipment to use it! 5G was made to go faster, but use existing cabling. Regular cat6e cable can be used, and 5G is a subset of 10G, so all switches etc. can be kept in service. 5G gives users in the vision market USB3 speeds, but with ALL of the regular GigE features, at a very small premium! What is CoaXPress, especially with “CXP-6” capability? 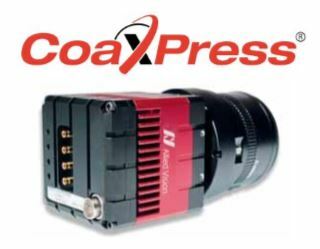 CoaXPress is an established industry standard allowing high speed communications over coaxial cable. The current version supports bit rates up to 6.25 Gbits/sec over a single coaxial cable. When used in parallel, two or more coaxial cables can provide incremental speed gains. The naming convention associated with CoaXPress signify the bit rate as seen in the chart below. In cases that you see CXP-6 has a bit rate of 6.25 Gb/s. The 4 x means the number of lanes. Multiply the 2 and you get your total bit rate. 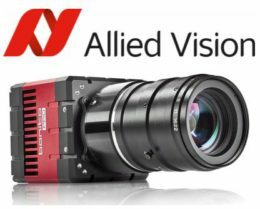 The new Allied Vision Bonito Pro cameras utilize 4 DIN 1.0/2.3 connectors on a CXP-6 interface (4 lanes) x 6.25Gbits/Sec. This allows for resolutions of up to 26 megapixels to reach 70 frames per second (fps). The first two Bonito PRO models (Bonito PRO X-2620 and X-1250) support high resolution with 26.6MP and 12.5MP at 80 and 142 fps respectively. The Bonito PRO cameras are ideal for a wide range of applications including, 2D/ 3D surface inspection, high speed printing, PCB & Electronics inspection. Even faster frame rates can be achieved using the Bonito Pro X1250 (12.5MP) in partial scan mode. Set to a 768 line height, a rate of 503 fps can be achieved! The following video’s are good representations of what this relates to in real applications which you can appreciate. Fan-less design for industrial imaging applications. DIN 1.0 / 2.3 CoaXPress connections for secure operation in industrial environments. CCD vs CMOS industrial cameras – Learn how CMOS image sensors excel over CCD! CMOS Image sensors used in machine vision industrial cameras are now the image sensor of choice! But why is this? 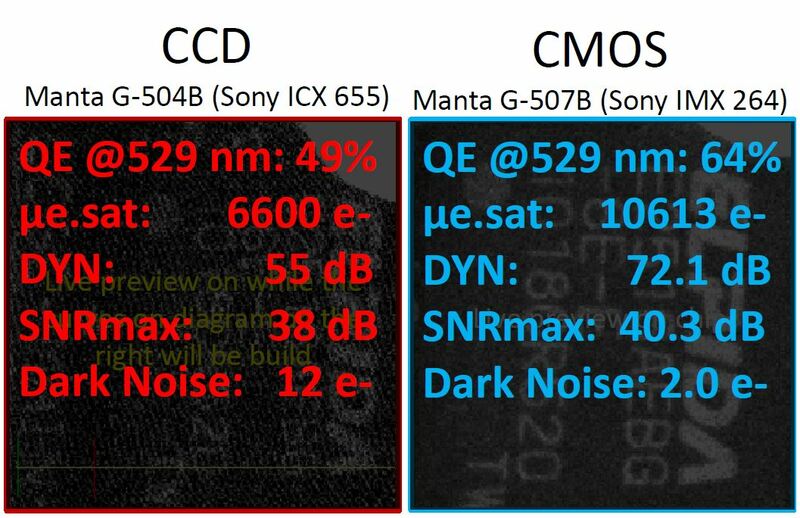 Allied Vision conducted a nice comparison between CCD and CMOS cameras showing the advantages in the latest Manta cameras. High Dynamic Range (HDR) modes for acquisition of contrast rich and extremely bright objects. 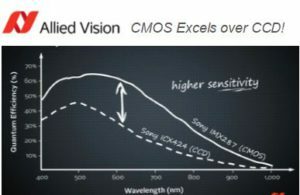 Overall key advantages are better image quality than earlier CMOS sensors due to higher sensitivity, lower dark noise, spatial noise and higher quantum efficiency (QE) as seen in the specifications comparing a CCD and CMOS camera. Comparing the specifications between CCD and CMOS industrial cameras, the advantages are clear. Higher Quantum Efficiency (QE) – 64% vs 49% where higher is better in converting photons to electrons. Dynamic range (DYN) – Where CMOS provides almost +17 dB more dynamic range. This is a partial result of the pixel well depth along with low noise. Dark Noise: CMOS is significantly less vs CCD with only 2 electrons vs 12! Images are always worth a thousand words! 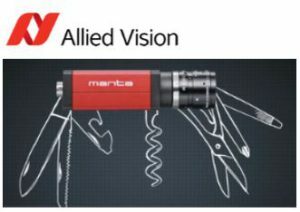 Below are several comparison images contrasting the latest Allied Vision CMOS industrial cameras vs CCD industrial cameras. High noise in the CCD image causes low contrast between characters on the integrated circuit, whereas the CMOS sensor provides higher contrast. Increased Dynamic range from the CMOS image allows darker and brighter areas in an image to be seen. The battery (left part) is not as saturated vs the CCD image allowing more detail to be observed. Smearing (vertical lines seen in the CCD image) are eliminated with CMOS. Smear has inherently been a bad artifact of CCDs. Dynamic Range inherent to CMOS sensors allow the LED’s to not saturates as much as the CCD allowing more detail to be seen. Lower noise in the CMOS image, as seen in the bottom line graph shows a cleaner image. Higher frame rates and shutter speeds over CCD resulting in less image blur in fast moving objects. Much lower cost of CMOS sensors translate into much lower cost cameras! Sony ICX424 (1/3″sensor), can also be replaced by the Sony IMX287 (1/2.9″ sensor) with pixel sizes of 6.9um closely matching the older IMX424 having 7.4um pixels. Allied Vision Manta G-040 is a nice solution with all the benefits of the latest CMOS image sensor technology. View the short video below for the highlights. What are the attributes to consider when selecting a camera and its performance? Single sensor machine vision cameras use a mosaic filter placed on the sensor to create color images. This is also called a ‘Bayer’ filter, named after the person who invented it. However, color images from this filter lose resolution and color fidelity compared to ‘true’ color images. Spatial resolution is lost due to interpolation, while the Bayer filter pattern reduces true color representation, sensitivity and dynamic range. 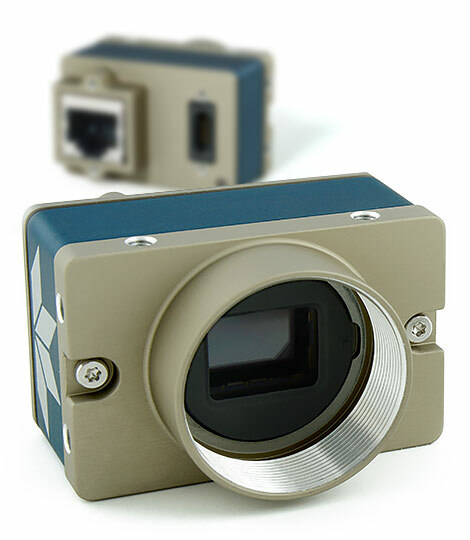 To overcome these issues, multi-sensor (3-CCD / 3-CMOS) machine vision cameras can be used. Typically, machine vision 3-CCD cameras were high cost, until now with CMOS sensors becoming the leading image sensor technology. Now, machine vision 3-CMOS machine cameras provide major benefits over Bayer cameras and at more attractive entrance cost. 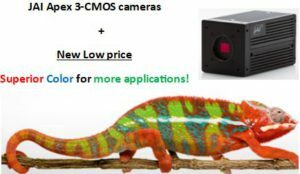 CMOS sensor technology has lowered the price of 3 image sensor cameras by 50% providing a better alternative to Bayer color cameras for many applications. 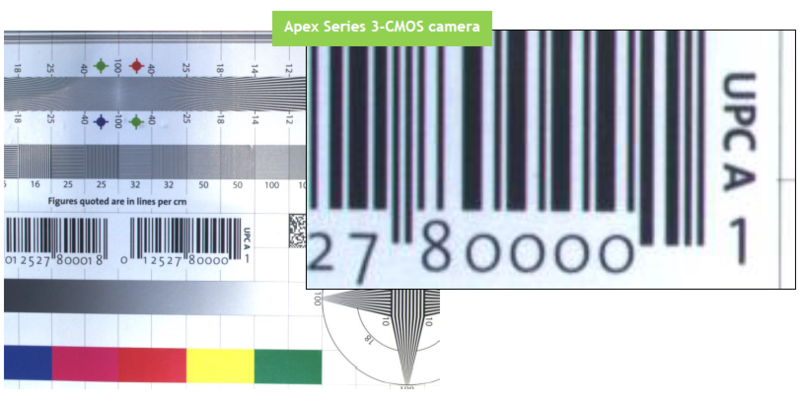 JAI’s Apex Series 3-CMOS cameras are the game changer for demanding color applications. 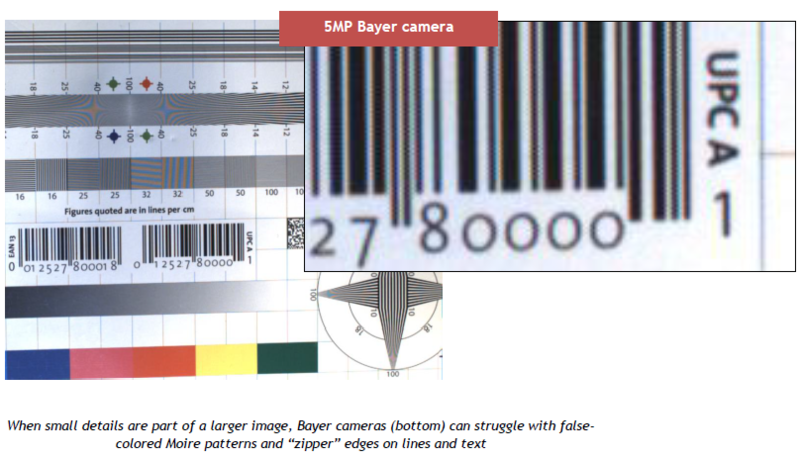 Better color precision – Accurate RGB values are obtained for each pixel so there is no interpolation/estimation of colors as found in Bayer cameras. This can be critical for paint/ink matching, printing inspection systems, digital pathology, or other applications where color values must be extremely accurate. Higher sensitivity – The prism glass in the AP-3200T-USB and associated cameras, has better light transmission properties than the polymer filters in a standard Bayer sensor. This enables more light to reach the pixels for better overall sensitivity and lower lighting requirements. Lower noise, higher dynamic range – White balancing on a JAI prism camera can be done on individual channels with shutter adjustments instead of adding gain to the image. This results in lower noise and higher usable dynamic range. What about “improved” Bayer capabilities like 5×5 interpolation? means you are using an even larger area within the image to estimate each pixel’s color value. So while this can do a better job of “smoothing” color transitions to the eye, it can actually result in less-precise color values for image processing, especially where color variation is high. This is illustrated in the following images, under identical conditions, by a camera with 5 x 5 debayering and a JAI Apex 3-CMOS camera. The CIE L*a*b* reference chart provides a set of exact color values when expected under specified lighting conditions. The result: 5×5 debayering results in 40% out of match to the expected colors vs 13% for the JAI Apex 3-CMOS camera! Color Space conversion: Color data from the camera can be provided using built in conversions to several color spaces including sRGB, Adobe RGB, CIE XYZ and HSI. Custom RGB conversions can also be done using the cameras color matrix circuit. Color Enhancer Function: Allows the 3-CMOS cameras to “boost” the intensity of 6 colors to help features stand out, such as the red color of blood vs surrounding tissue in a medical application. Additionally, degree’s of edge enhancement can be to increase the contrast of color boundaries. Color Binning: While most Bayer cameras do not offer this, due to the prism architecture of the 3-CMOS cameras, you can easily bin pixels by 1×2, 2×1 and 2×2 to increase sensitivity, reduce shot noise and / or increase the frame rate. 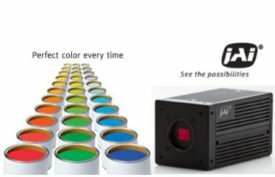 All of these features, along with reduced costs for 3-CMOS color cameras, now make this a very attractive solution for demanding color applications! Applications in eye diagnostics, pathology, surgical imaging, meat/food inspection, print inspection and automotive color matching are a few that would highly benefit from the JAI Apex 3-CMOS camera series. 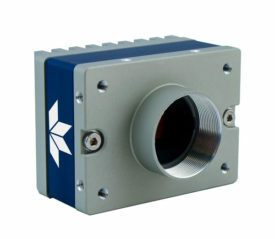 Need to proof 3-CMOS / 3-CCD prism based cameras will enhance your application? Let’s discuss sending you a demo camera! Currently there are 6 new CMOS models outlined below and full specifications can be found HERE. 1st Vision is the leading provider of industrial imaging components with over 100 years of combined imaging experience. 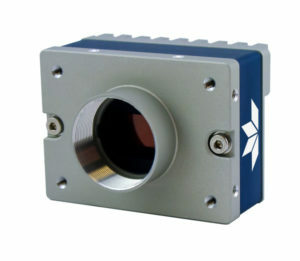 Do not hesitate to contact us regarding the new prices of the 3-CMOS cameras! How does a 3CCD camera improve color accuracy and spatial resolution versus standard Bayer color cameras? White Paper -How does prism technology help to achieve superior color image quality?